Ten years after this picture was taken, I am working in the San Francisco Ayusa office continuing the legacy and tradition of one of the values that my parents worked to instill in me: tolerance through exposure to cultural diversity. It all started with my brother, Mike, at 15. Mike spent one year in Norrkoping, Sweden that changed his life forever. I still remember hearing his tearful messages on our answering machine while he was going through the depths of homesickness, watching my mother's painful reaction and my father reassuring us that this was essential for his growth and success. When Mike came back to the States, he expected everyone to speak to him in Swedish. Ha! Oh, the joys of readjusting to your own culture! The exchange experience and its obvious impact on Mike spread throughout my family. Mike began volunteering to help with host families and students in the Charlotte, North Carolina area. Then we independently hosted his best friend from his exchange in Sweden, Robert. Now, not only was I seeing the impact on my brother, and meeting other exchange students, but I was feeling the impact of hosting and gaining a new brother. To this day, Robert is family and his year with us will never be forgotten. With my house and adolescence now an eclectic hodgepodge of different cultures, my family moved to South Carolina. One of the first things my parents did upon unpacking was look for an Ayusa rep. My brother had just left yet again on the Ayusa-sponsored CBYX Program, so we were very familiar with Ayusa. 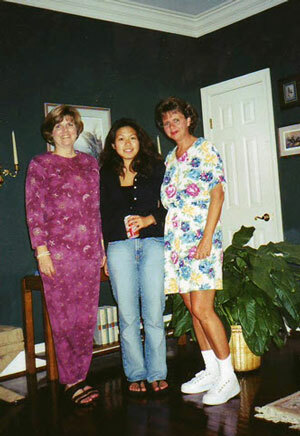 Nancy Matuszek (pictured here with my mother and her Japanese exchange student) brought us into the Ayusa family. 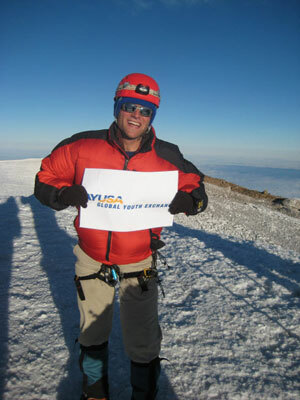 The following year, we were hosting an Ayusa student, Pavel, from Poland. Yet another international imprint was left on the Byrne family and my life. Finally I graduated from high school and was accepted to college, but not before I applied for an Ayusa outbound exchange to Spain. Now it was my turn to complete what I thought was the last piece of the Ayusa exchange experience—actually going abroad. The experience in Spain – I flew out of New York on September 8, 2001 and woke up in my host family home on day one of my exchange, September 11, 2001 – was one that shaped the course of my adult life. I was rematched from my first family. I lived in a farming community with host parents that worked the olive fields and asparagus packaging assembly line; a far cry from my parents in the US that are a Lutheran pastor and CPA. Want a fun experience? Try explaining your catechism and your father's midlife career change from economist to pastor to farmers in southwest Spain, in Spanish all while balancing the stereotypes presented in the media about religion in the U.S. FYI: there's a war on terror and a world that is growing increasingly anti-American. Whew! I learned the value of just listening during all of this. The years after my Ayusa exchange were forever shaped by time in Spain and before. I did a college exchange in Argentina, revisited Spain and my host parents and I continue to travel at every opportunity, especially if it involves climbing a mountain. Most importantly, I now work for the organization that provides these life-changing experiences to thousands of people everyday. When I was in Spain, homesick, confused and feeling alone, I vowed that one day I would work for Ayusa and use my experiences to help future students. The world was falling into global conflict and the stakes and importance of human diplomacy were crystal clear. We needed to work to understand one another. We hear it over and over that Ayusa provides life-changing experiences. It's true. 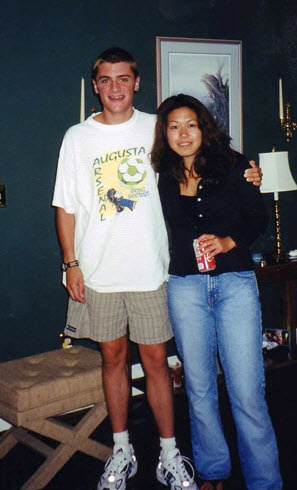 Looking back at this high school picture in my shorts, braces and awkward smile, I think about Nancy, the events that she and Marion Crane, another Ayusa staff superstar, put on at their homes and the students that they exposed me to. On such a personal and community level, these wonderful women continue to plant seeds for understanding and peace. They alter the course of youths' lives on a global scale. I owe them for bringing me into Ayusa and bringing me into this family that I'm so proud to represent.